The Mediator pattern simplifies communication among objects in a system by introducing a single object that manages message distribution among other objects. The Mediator pattern promotes loose coupling by keeping objects from referring to each other explicitly, and it lets you vary their interaction independently. The diagram below illustrates the Mediator pattern. 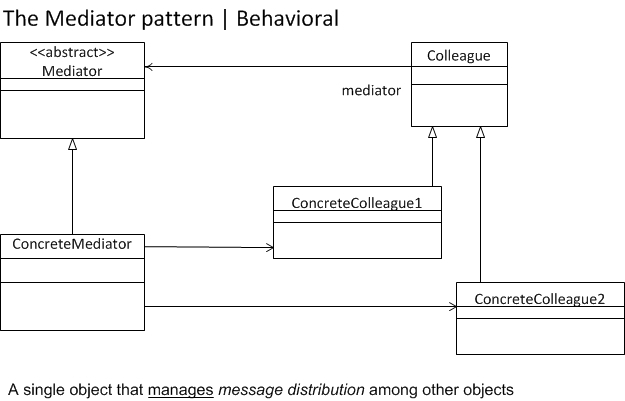 Mediator Pattern: A single object that manages message distribution among other objects. Components are more generic, because they no longer need to contain logic to deal with their communication with other components. You want to customize a behavior that's distributed between several objects without using subclasses.